The Gopher Tortoise is a member of a group of land tortoises that originated in North America over 60 million years ago. It is, therefore, one of the oldest living species. Gopher tortoises can live to be 100 years of age.As I am spending my summer in Florida, I have many opportunities to observe the ancient looking creatures. I was taking an evening walk after dinner one night and decided to walk through a preserve right beside our apartment complex. Florida is full of preserves to protect the wildlife and flora that might otherwise fall by the wayside due to expansion of our commercial and residential contruction. This particular preserve has a handicap-accessible sand trail that was easy to traverse. Keeping my eyes sharply focused on the trail ahead and beside me, I took care to watch for snakes, etc. Happily, I saw NO snakes. They most likely were there, but I didn’t see any. The trail is pretty along a lagoon. I loved the sounds of the birds, crickets, etc. The trees and shrubs were lovely sub-tropical which was easy to enjoy. 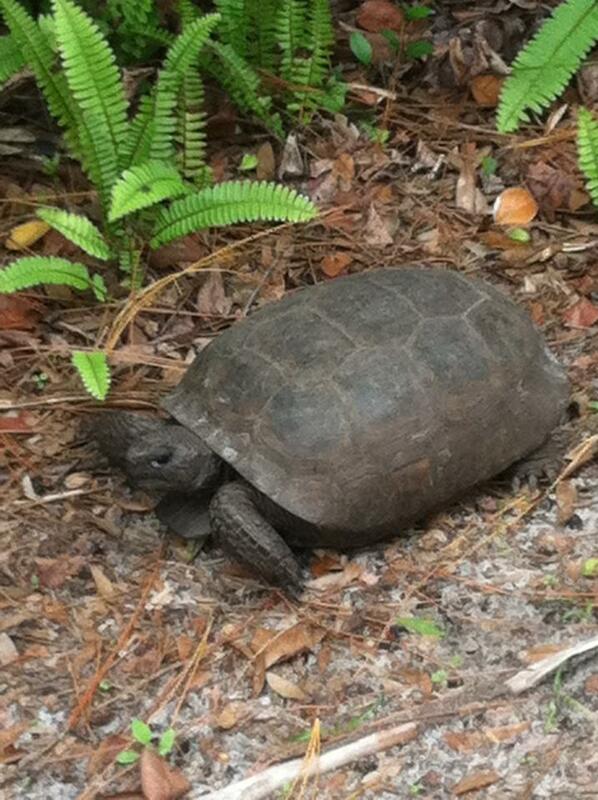 I turned a corner on the trail and was face-to-face with a large Gopher Tortoise. We both froze in time checking the other out and he could have been a sculpture he was so very still. I decided to inch my way to the edge of the trail opposite from his edge. That worked well without a move from him. Then, I decided one of us had to move, so I very slowly took a couple of steps crossing by him and he remained still. A couple more steps forward and I looked back and he was on his way to wherever! Gopher Tortoises dig big and deep burrows in the land for their home. Some burrows can be as large as 50 ft. long. When they leave their home, other wildlife will move in and make it their own. In Florida, the Gopher Tortoise is on the Endangered Species list due to habitat loss. My son-in-law is a land developer and has come upon gopher tortoises in the development process and the entire development process is halted to re-draw plans to protect the tortoise’s habitat. Hence, one finds many preserves alongside residential and commercial developments. After all, they were there first!